Add our integration code to your website. That’s it, you will now start getting subscribers and can send notifications directly from the Dashboard. No coding knowledge required and everything else can be easily managed from the Dashboard. It is always a good practice to set-up a welcome notification which is sent as soon as a user subscribes. Once our code is integrated, visitors will be automatically prompted to subscribe to your site and in just 1-click converted into subscribers. No need to ask for email or any other information. This gets you higher opt-ins, minimizing annoying pop-ups. 1-Click subscribe is available on both desktop as well as mobile devices. Given that push notifications are clickable, you instantly get an audience which can be re-engaged with more content. We support both HTTP and HTTPS websites. With PushAlert, Web Push Notifications work on HTTP websites as hassle free as on HTTPS websites, no multiple popups or redirection. You get higher opt-in and better conversions. HTTP website owners don’t need to buy a SSL certificate for Push Notifications, PushAlert will provide you a branded HTTPS subdomain. Webmasters can also use a separate HTTPS domain or subdomain for their website to send Notifications. PushAlert Plugin for WordPress, automatically installs the code on your website and gives you the option to push notifications directly from the Editor. For Joomla CMS users, our extension automates the integration and all you need is to enter website ID, the rest is handled by us. Tap into user interests with Audience Creator and create a highly engaging notification campaign personalized for a subset of your audience. Target users based on keywords, URL opened and number of visits. Create unlimited custom segments as per your requirements. Use location, device and OS for advanced targeting. Add your own custom attributes to define events or ROIs. Revive your older popular content by targeting it to new subscribers by using time of visit. Targeting notifications to these precise sets would result in better user-experience and a loyal subscriber base for meaningful engagement. Call-to-Action buttons are a new addition to Push Notifications on the Web which can push engagement through the roof. Up to 2 CTA buttons are supported with Web Push Notifications. The icon on each button, text as well as landing URL are all customizable. CTR for each button is shown separately in our Analytics, so that subscriber interest can be tracked. With the addition of CTA buttons, your notifications now have 3 clickable actions giving you up to 4X better conversions. CTA is currently supported on Chrome (Desktop, Android) and Opera (Android). PushAlert comes with a built-in scheduling feature giving you the flexibility of sending notifications even outside of work hours. Add notifications to a queue selecting their audience, customizing the message and title for each. All scheduled notifications can be edited along with their timing. Schedule your push notification campaign well in advance before a particular event, say, a major sale like Black Friday. Scheduled push notifications also give the option of re-targeting users from outside your time zone. A simple acknowledgement goes a long way, and helps build a loyal user base. A welcome notification can be used to convert a potential lead, by say, providing a coupon to a first time user or a limited period offer. Even your current popular content can be pushed across to improve readership. This builds expectation and familiarizes your audience with push notifications, which makes them more likely to click. Since Push Notifications are directly delivered to your subscribers, you won’t want them to be overwhelmed with multiple notifications. To help, we have come up with a smart solution - RSS Push. With your RSS Feed, we create a customized newsletter where you can choose multiple articles/offers to show and send it to all your subscribers at once, instead of separate notifications. The icon, title, and as well as the theme can be customized. RSS Push page is optimized for both desktop and mobile devices. Combined with our Analytics, you can see the time when your users are most active and send them this custom RSS Push page. Push Notifications are short and delivered instantly, it is important to use the best combination of title, image and message to get most out of it. This is where A/B Testing can help. Easily create two variations of your notification with different image, title or message. Then we determine the notification that is getting better response from a subset of your subscribers. Push the one that will result in higher conversion to the rest, bringing in more pageviews and revenue. With each test you get to know your audience better and improve your notification strategy. On average, 70% of all carts are abandoned but they are recoverable by reaching out to customers at the right time. PushAlert lets you recover lost sales with automated push notifications when customers forget to checkout. You can personalize abandoned cart push notifications with items in cart and names of your customers. Stop losing sales even when your products are out of stock. Customers can subscribe to alerts and get a direct push notification (automated) on their phone or PC as soon as the product they wanted is back in stock. You may have already spent a lot on marketing and bringing customers to your store, but many of them leave without making a purchase. With PushAlert, your customers will automatically get to know when a product they like is on sale or at a discount. No additional spending on marketing for promoting a sale. Automated notifications whenever a product is on sale. Let customers know that their order is on the way, with real-time automated notifications and tracking details. Automated* notification when shipment is fulfilled. Improve customer experience by keeping them in the loop. Target individuals based on what they were looking for and inform them about an upcoming sale. Notify your customers about abandoned carts and entice them to complete the purchase with a special discount voucher. Leverage your data, and PushAlert Subscriber IDs to send a customized notification, with say, a name, to individuals about an abandoned cart or shipment of products. Create a variety of events to fire notifications to specific customers for price drops, new launches, blog posts and more. This builds loyalty and trust, getting you a customer for life. Full Funnel Automation to get customers back even if they have dropped off. Discretely define steps in your funnel and reach out to users at every stage to minimize drop-off. Set timeout after which the notification with a relevant custom message is sent. Further segment customers based on their country or device they were using, when they entered the funnel for maximum conversion. Events are user interactions with content on your page. These are independent of website load and allow you to track the behavior of visitors. Target your visitors and customers based on their actions on the website. Track custom events such as a download, link click, scroll to a particular part of page, video play, ad-click and so on. Trigger notifications based on these events and a single page can trigger multiple events based on the subscriber's interaction. Send automatic notifications whenever a new post is published. You can limit the number of notifications going out in a day. Choose whether all notifications for new posts in a given duration should be sent out. You can also set the minimum delay between two notifications. Send top posts of the day in a custom newsletter notification. With automated newsletter notification, you can set at which time the newsletter has to be send out and carrying how many posts. If you have images in your feed, they are also added to the newsletter. Since the newsletter is hosted on PushAlert, there is no additional burden on your server. Get more subscribers by converting the entire push notification subscription process in your own language. Your customers/visitors will be able to know exactly why they should subscribe to your updates, that too, in your own words. Starting with the notification prompt, button text, to the widget, everywhere you can change the default text to the one you require. Moreover you can send notifications in any language as well. With opt-in customization you can present visitors with a custom prompt to subscribe to notifications. You can choose from 5 opt-in themes and also set a delay for the prompt. First is the default browser theme or you can choose from more informative options (with customizable text) like the subscription box, wide-bar or strip themes. You can further change the position of the prompt, set colors to match your website theme. With our pro stats dive deep into how your notifications are performing using measurable statistics like click-through rate (CTR) and delivery rate. Performance statistics help you get better at sending notifications, both in terms of content and timing. Check how much your reach has improved with growth in subscribers and effectiveness of your re-marketing efforts. Get to know when your subscribers are most active, and combined with scheduled notifications create a highly engaging notification campaign. Click Timing gives you an expanded view on notification performance spread throughout the day. You can also get the best time to send, based on previous learning during the last week, month or quarter. Your visitors are spread across a variety of devices, browsers and operating systems. We make it easier to identify where subscribers are coming from, whether it is from a desktop, tablet or Smartphone and help improve your strategy accordingly. Check which browsers or operating systems are being used by your subscribers. Get better conversions by studying user behaviour. Know which platform is fetching better CTR and target it explicitly. Location analysis is a key factor in determining user behavior, giving an insight into how to keep your visitors subscribed and engaged all over the world. 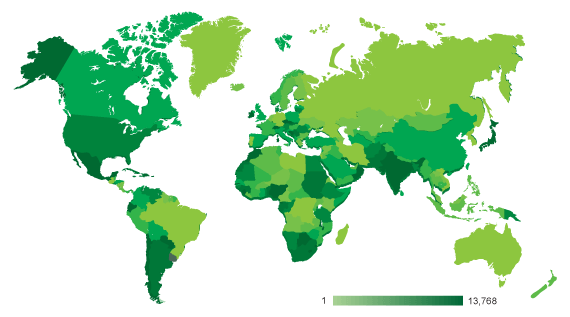 Geo-analytics lets you study where your major subscriber-base comes from and target them with specific content. You also get to know which type of notifications work for certain regions, this helps in narrowing down the ROI for a particular location. Since these are directly delivered to your subscribers in real time, you need to make sure your users are active during the notification cycle. PushAlert works with all major browsers spread across a variety of devices and platforms. For now, Web Push Notifications are supported on Google Chrome, Mozilla Firefox, Microsoft Edge, Opera and Apple Safari on the desktop front, while on the mobile side of things it only works on Android in the above mentioned browsers with the exception of Safari on iOS. 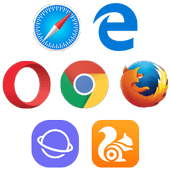 We support all browsers on all major OS platforms, Windows, MacOS (OSX), Linux, ChromeOS as well as Android. At present, web push notifications are not supported on iOS, but we will get to working on that as soon as Apple adds support. Windows, Android, Linux and MacOS (OSX). Add multiple websites to the same PushAlert account, with a central control over all your web properties. You can manage their notifications all in one place, and also get a quick glimpse of overall performance of push notification campaigns spread across various websites. This helps in targeting audience on the fly, without custom segments. It is a basic version of the more powerful Audience Creator. General audience targeting gives you the option to select subscribers based on devices or OS used, location and browser. This can come in handy for delivering specific content, offers or discounts. There is no limit on number of segments. These can be made based on any criteria using our APIs or from the Dashboard. Then you can add rules for adding subscribers to these segments on your website. This will give you a greater control over targeting specific subscribers and getting good conversions. Backed by our powerful REST API, Email Push allows you to send Push Notifications from anywhere and from any device. No coding required and you don’t even need to be logged into your account. Just use the API key and send details in a prescribed format. Once the email is sent, we will push the notification to all subscribers. Whether you are an individual, a small business or an enterprise, our engineers will help in integrating PushAlert push notifications on your website. In due time, they will also guide you in improving your notification strategy to improve conversions. Our comprehensive Help Center will resolve any query you have on registration, installation, migration and billing. But if you need more help about a particular feature, or the service in general our support team is always at hand, 24/7, on both chat and email to provide a resolution.